Just fallen in love recently or having been together for some time already, one thing is always important: to spend some special and quality time together. This means to leave everyday life behind, to do fun things that both enjoy and to bring a breath of fresh air into the relationship. What could be more suitable than wellness and treatments for couples at one of the Dolce Vita Hotels? Wellness for couples – during a long weekend break or an entire holiday – relaxing with the most important person is surely allowed, or? Make time for wellness and romance pure during your holiday. Hiking together through the magic of South Tyrol, culinary delights at the top restaurants of the Dolce Vita Hotels and relaxing together in the wellness area. Select from the couple treatments with two masseuses or other packages. 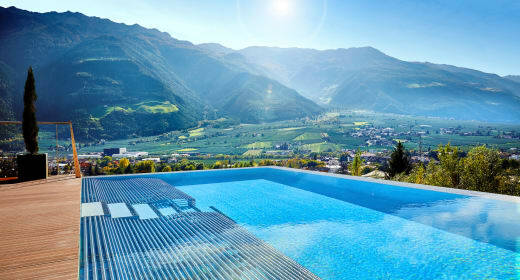 We provide individual advice for a wellness holiday for couples in South Tyrol. The team of your hotel will be delighted to compile a wellness programme for you so that you can enjoy relaxing hours – even long after the treatments.